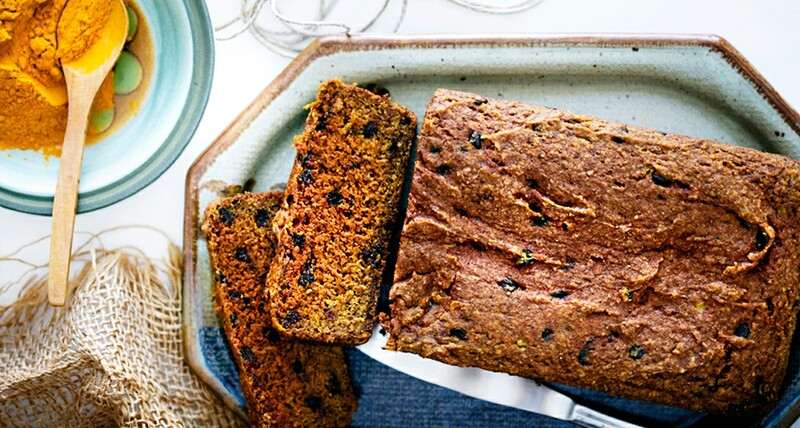 Anti-inflammatory turmeric and ginger add a delicate spiciness and gorgeous color to this simple dark-chocolate-studded banana bread. Along with these features, it’s gluten-free and vegan. Pack it up for a healthy snack or enjoy for breakfast. Line a 9" ? 5" loaf pan with parchment paper; set aside. In a large bowl, mix together all dry ingredients, except chocolate chips. In a medium bowl, mix together all wet ingredients. Add wet ingredients to dry ingredients, mixing until fully blended. Pour into prepared pan and bake for 40 to 45 minutes, until a toothpick inserted in the center comes out clean. Cool in pan for 15 minutes before removing to a wire rack to cool completely before slicing. Store in an airtight container in the refrigerator for up to one week, or tightly wrap and freeze for up to one month. Allergy Information: Dairy-free, gluten-free, peanut-free, soy-free, vegan.